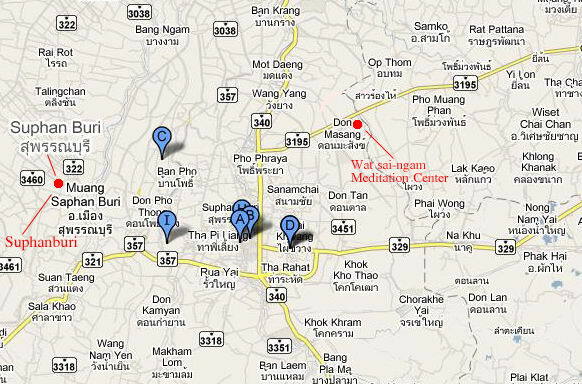 Wat Saingam Meditation Center is on The Suphanburi - Viset Chai Chan - Angthong Road (3195), 15 km. from Suphanburi city. 1. From Bangkok , Take a bus from The Northern (Moh Chit) Bus Terminal, by bus number 951 Bangkok - Angthong - Suphanburi. Wat Saingam is on the left side, 15 km. before Suphanburi city. 2. From Bangkok, Take a bus from The Northern (Moh Chit) Bus Terminal, by bus number 974 (Northwest route 340) Bangkok - Suphanburi, then connect the local bus (Orange colour, no air con.) Suphanburi - Angthong - Saraburi, or connect the bus number 951 Suphanburi - Angthong - Bangkok. Wat Saingam is on the right side, 15 km. from Suphanburi city. 3. From Bangkok, Take a minibus at Pin Klao station (Northwest route 340) to Suphanburi - Viset Chai Chan, 15 km. from Suphanburi city. The minibus will drop you in Wat Saingam area. 2nd station at the front of The Pin Klao Kung Luang Restaurant (Big lobster sign), just near by the department store. **Tell the driver or the ticket collector to drop you at Wat Saingam. On the way back, you can catch the bus in front of The Wat Saingam entrance back to Bangkok. Or you can call the minibus to pick you up at Wat Saingam area to Bangkok, end route at Ratchadamnoen Road, just near by Khao San Road.